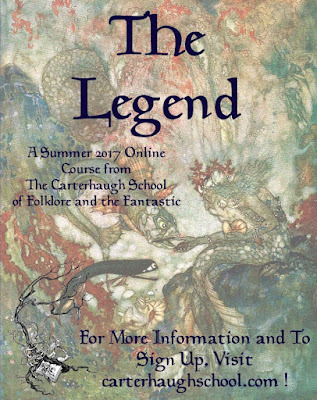 Carterhaugh is where it's at for Summer folklore and fairy tale studies this year! 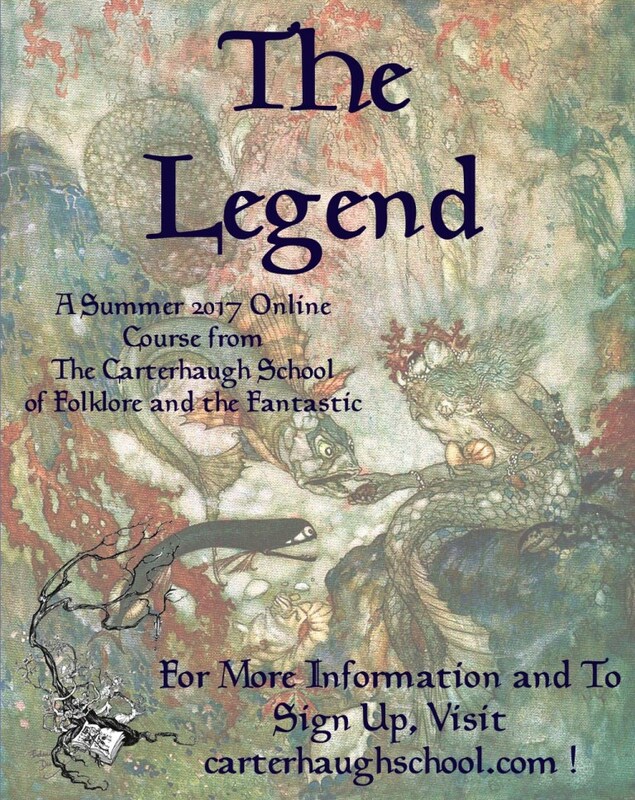 (Carterhaugh School of Folklore & the Fantastic, that is.) And time is running out to sign up! Did you just need a little reminder of the awesome awaiting you to complete that registration? Go directly HERE to sign up BEFORE MIDNIGHT this FRIDAY. Need some more background before you commit? Happy to help. We highly recommend CarterhaughSchool's courses but why do we love Caterhaugh's founders and professors, Brittany Warman and Sara Cleto (and their sometimes-guest-lecturer Shveta Thakrar) here at Once Upon A Blog? It's not just because these ladies are passionate about all aspects of fairy tales, combining formidable scholarly-chops and research with accessibly-lovely whimsy and humor (because they most definitely do! ), but because they make their courses appeal to a wide range of folks. They're inclusive and lay-friendly, while remaining challenging and engaging for the experienced scholar as well. 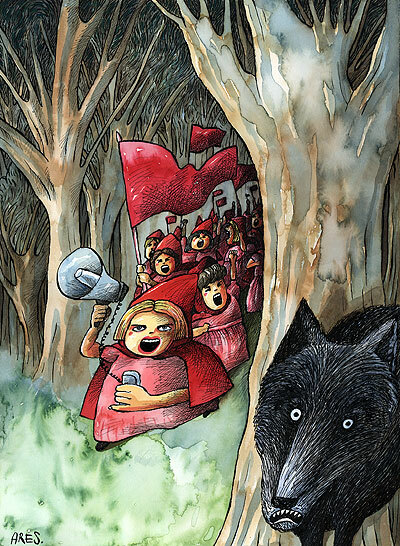 Their materials combine the best of old world research and resources, with the tech-savvy and visual eye candy that appeals to critical, yet hungry contemporary fairy tale folk. They're fresh yet grounded, and have helpings aplenty of brains and beauty in the presentation and the content. Best of all, they specifically encourage personal development along an individual's chosen 'path' (scholar, writer or artist) for the final assignment so you can make your study relevant to your personal life and journey. Like folklorists tend to do, the study becomes part of the student's actual life and experience. These ladies are a hoot! We love that they're prepared to jump into fairy rings! To give you a sense of where it's possible to go with them in discussions and study, we recommend listening to their awesome interview and discussion on inclusivity in fairy tales with the for Hugo Finalist SF/F podcast The Skiffy and Fanty Show. You might be surprised at the depth they go to in the hour long show - which we recommend making time to listen to, even if you have to do it in sections. It's too good to miss and inclusivity is something we need to be especially aware of at this point in time. But back to Caterhaugh's current offerings - WHICH ARE STARTING UBER-SOON. 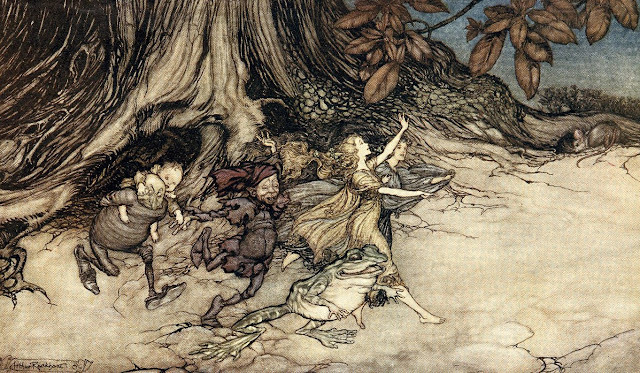 This time around these fairy godmothers of folklore and fairy tale studies are bringing us a long course (ten lessons over ten weeks) on LEGENDS. 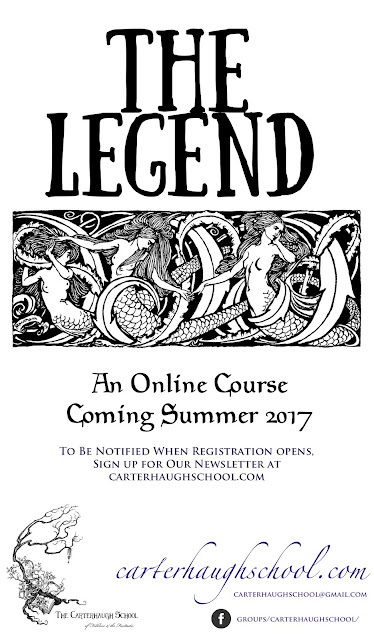 But wait: why are fairy tale mavens teaching a whole course on legends? Legends aren't fairy tales, right? 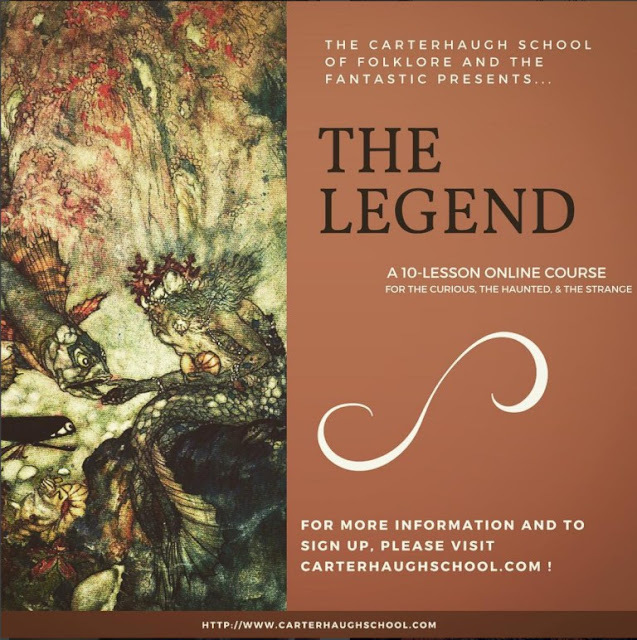 And we also highly recommend their 10 Reasons to Study Folklore - (two words: 'ceiling cat') which should provide a good bridge into the upcoming course on Legends as well. 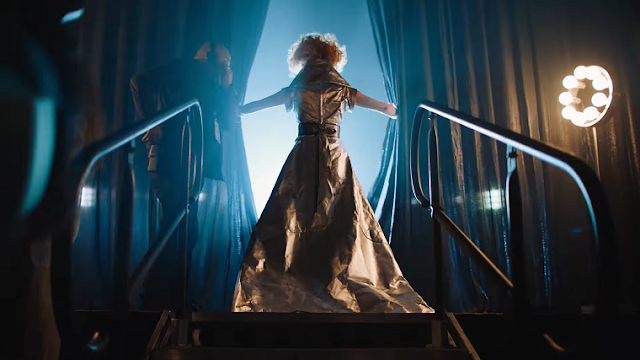 "We’ll look at supernatural legends, urban legends, and historical legends, leading you through the woods beyond King Arthur’s court and into a fairy’s grotto and out again into the haunted synapses of the internet. " Do you feel your eyes getting bigger with each section? We do! So guess what we've just added to our Summer program? Just like with the fairy tale long course, you can read a summary of how it works around your personal schedule HERE, with a list of the dates of each set of materials being sent and the lectures and additional teaching material becoming available, as well as your unique Carterhaugh keepsakes (in the form of beautifully designed Grimoire pages for you to build your own magical book of knowledge). You can register HERE but it must be by midnight, June 30th 2017, EST - THAT'S THIS FRIDAY MIDNIGHT EST FOLKS! The course will be conducted through video lectures that will be accessible on the dates listed below, but all the materials will be yours to download and interact with whenever you choose (so don’t worry if you can’t play on those specific dates!) The price for this 10 lesson class will be $200, payable in one, two, or four installments. Full payment must be complete by the time registration closes on June 30th at midnight. Aside from the videos you will also receive the PowerPoint presentations featured in the video lectures, a beautifully made PDF “grimoire page” summary of each lesson, and any supplementary reading. This material is yours to keep and download for personal use! There will be a final assignment prompt for which you may choose the path of the scholar, the path of the writer, or the path of the artist. Personal feedback on completed final assignments is available upon request – we would love to see what you come up with! Dates: July 1st, 8th, 15th, 22nd, 29th, August 5th, 12th, 19th, September 2nd – note that these are simply the dates that materials will be posted! You will be able to download everything and watch whenever is most convenient to you. Price: $200 – you can pay in one, two, or four installments! Full payment must be complete by the time registration closes on June 30th. 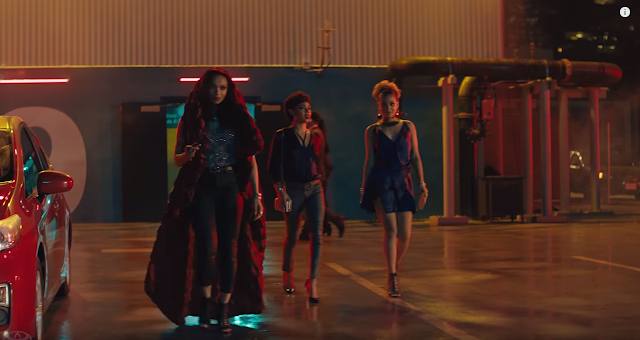 Take a look at the trailer and see how many different references you can find, just in this teaser. (We were thrilled to see yule goats included!) And you know there will be more in the full short. 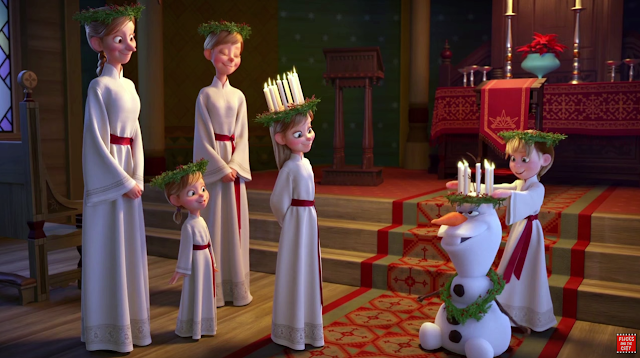 Our only query is whether they stuck to Euro traditions or went around the world. 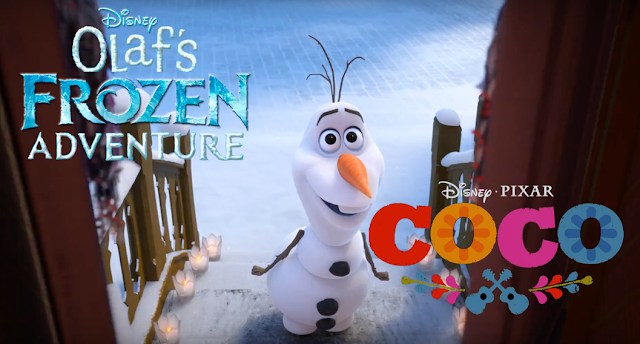 'Olaf's Frozen Adventure' will play in theaters before Pixar's 'Coco', starting November 22nd. 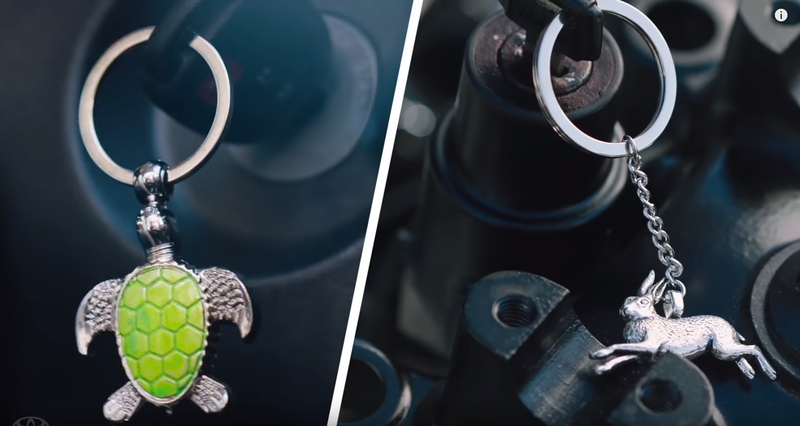 Some of these are fresher than others, but what's most interesting is that Toyota are using fairy tales at all in this social climate. It's another example of the two extremes that people are being drawn toward right now: either cynicism and reframing everything through the eyes of a 'false fairy tale', or wishing for magic and dreaming for a 'real one'. Our Fairy Tale News Hound has a special article up on Enchanted Conversation today. It's all about the importance of fairy tales when it comes to resistance. 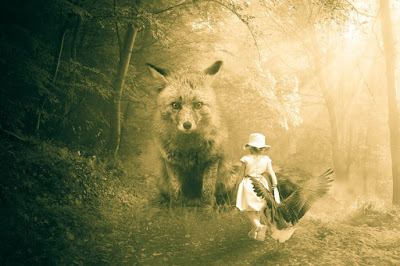 In fairy tales, wolves show their insides are the same as their outsides (despite their silver tongues), beanstalks prove to their climbers that greed is the true giant (though other big troubles may appear on the way) and flowers speak up to protest their plucking (even as they sink in their thorns). When impossible things happen, you begin to question reality. It's one of the reasons fairy tales are so very needed. Sometimes that Wonder, that impossibility, is the very thing that wakes us up and invites us to challenge the norm. You can keep reading at Enchanted Conversation HERE. We hope you will be inspired to keep use, telling and retelling fairy tales, and find solidarity with many others as you do. The hashtag/label, #RRR, that we're using on our Once Upon A Blog website, is searchable and by clicking it, you can find lots of inspiring reading, viewing and more. New posts are being tagged regularly and the recommendations are growing all the time. 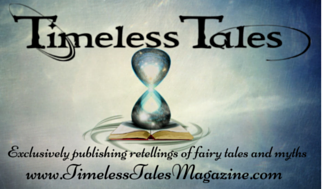 You can sign up for the Fairy Tale Round Up Newsletter (which OUABlog and Timeless Tales contribute to). The first newsletter went out some time ago and the next will very shortly (within the week). You can find the sign-up in the side bar HERE or learn more about it before signing up HERE. Enchanted Conversation is about to release their Donkeyskin issue, and Kate Wolford has just announced the writers for it HERE. The recent Diamonds and Toads issue was superb and we're really looking forward to this one too. 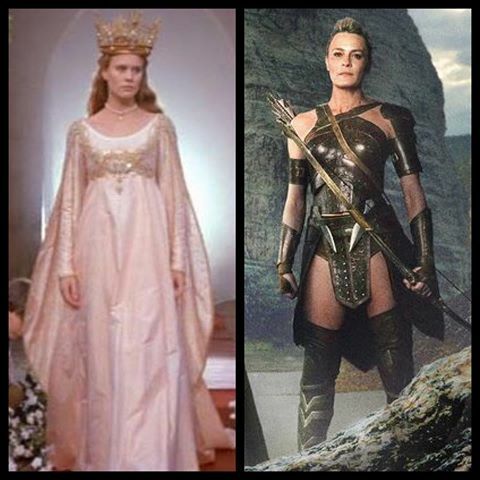 Robin Wright, who played Buttercup in 1987, also plays the Amazon warrior General Antiope in the new Wonder Woman movie, and it's resonating with people everywhere, especially those who grew up with The Princess Bride. It wasn't predictable, yet it seems... 'right'. 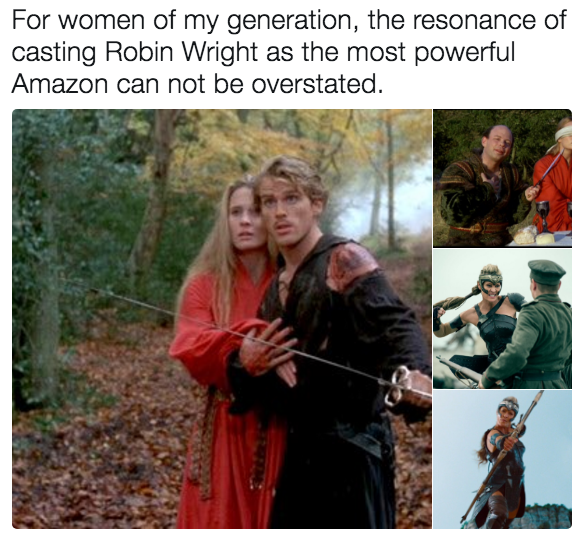 For the generations that were inspired by Robin Wright's feisty farm girl-turned princess in The Princess Bride (a genre-defying treatment of fairy tales at the time), to see that heroine 'grow up' and become more of what she naturally seems to have been, developed fully through to a resistant warrior general, who still manages to hope and believe in love, seems a continuation of Buttercup's fairy tale - and one that fits the fairy tale heroine we always saw her to be, and now can be inspired by - in a fresh way - again. For our Fairy Tale News Room folks, who are extremely happy about the Wonder Woman movie, that the movie is as good as we hoped it would be, and that generations of girls - and boys - will grow up with Diana as a relevant and respected role model (rather than being 'genre-d' to a corner with the comic books geeks, like she often so sadly has been), it's this depiction of an already strong fairy tale princess coming into her own that inspires us most. 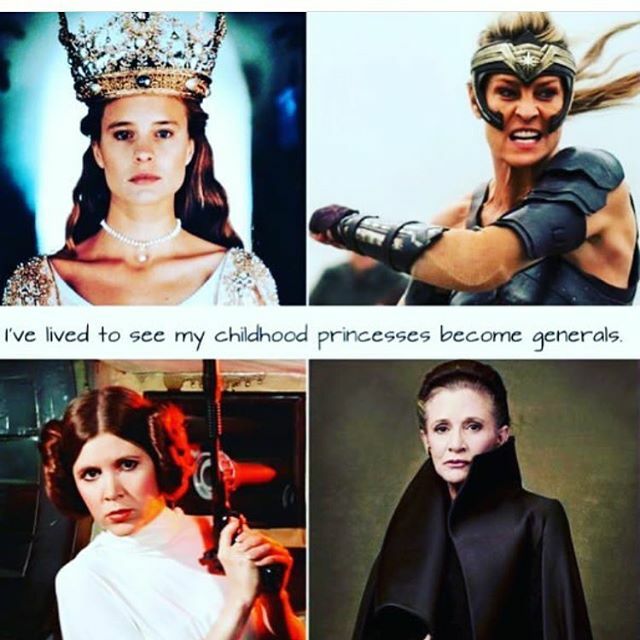 After recently seeing another role model princess, Leia, become a general and have that resonate louder and stronger than Disney and filmmakers expected, Buttercup's 'fairy tale part II', is the groundwork of more of the same to come: princess power of a different sort. The kind of princess power where it's clear it isn't just the sword* that makes the warrior but the spirit. We've had a lot of those fairy tale princesses appear in novels for some years now, but it speaks volumes to have the general public instantly recognize - and resonate with - a fairy tale heroine, become whom she was meant to be, and that her fairy tale representation is part of that. This is now in pop culture, recognized by society, rather than just by a select group who have been tracking strong fairy tale females all along. Best of all, for those women especially, who have had this revelation and are thirsty for more fairy tale heroines to 'own it', we have already accumulated a whole lot of stories, books, collections and more to share. Antiope is the whispered possibility that many of us never dared to dream. What if (Buttercup) had grown in strength and stubbornness and power until she could train one of the greatest warriors of all time? 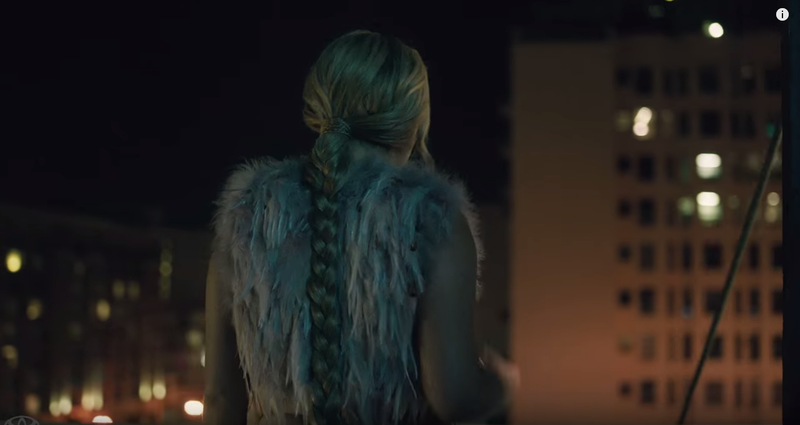 What if Buttercup, who believed so desperately in love, had passed that wisdom on to a young girl who would hold that belief in trust for every person she met? What if that line between a princess bride and Princess Diana is as thin as a page in a storybook? ...Of all the outcomes, we somehow received the reality where Buttercup moved on to master archery and serve an Amazon queen and command legions. ...This progression seems not just plausible, but essential. It is an epilogue of a different kind. We recommend reading the whole article. It's very uplifting and celebrates strong fairy tale females who have inspired generations, as well as new and timely role models for girls and women who could use a little inspiration again. 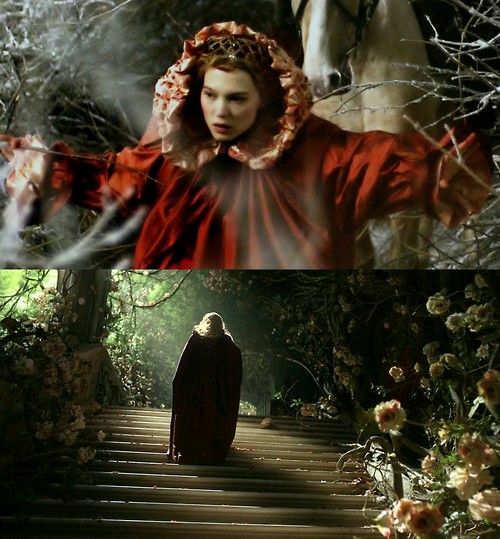 It also doesn't downgrade the importance of fairy tales in this process of 'becoming'. If anything, the article underlines the importance of fairy tales in the process, and that, even when empowerment is achieved, it's in our best interest to continue holding them close. We don't outgrow fairy tales. They can become part of us, even as they enable us to get there. Buttercup doesn't need to become Dread Pirate Roberts to 'fulfill her destiny'. The point is that, if she wanted to, she totally could. * And yes, we don't mind swords - or arrows - either! NB: The ezine, in PDF format, is digital only and not print resolution, due to restrictions on public domain image printing, and in an effort to keep the file as small as possible. Download from the members only, password protected link (sent to members via email after sign-up) is recommended for optimal viewing and to enable playing of embedded audio files. The announcements also include the resignation notice of our Fairy Tale News Hound from her AFTS duties, including the ezine. (See below.) 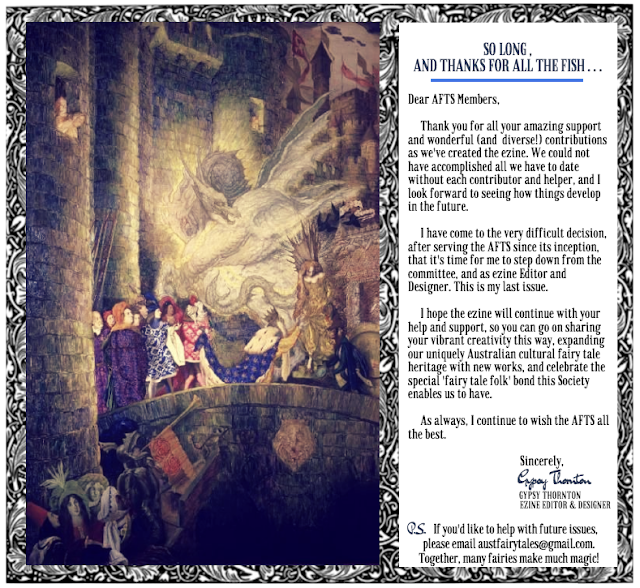 It was a very difficult decision to take a step back, especially with regard to this unique fairy tale focused magazine, but she felt it was personally necessary to do so at this time. We can vouch for the astonishing and unique pool of talent and expertise the Australian Fairy Tale Society has, and can testify that each one of the members our News Hound has worked with over the past eight to nine months (over four issues), has been a pleasure to work with in their enthusiasm and reach for excellence. 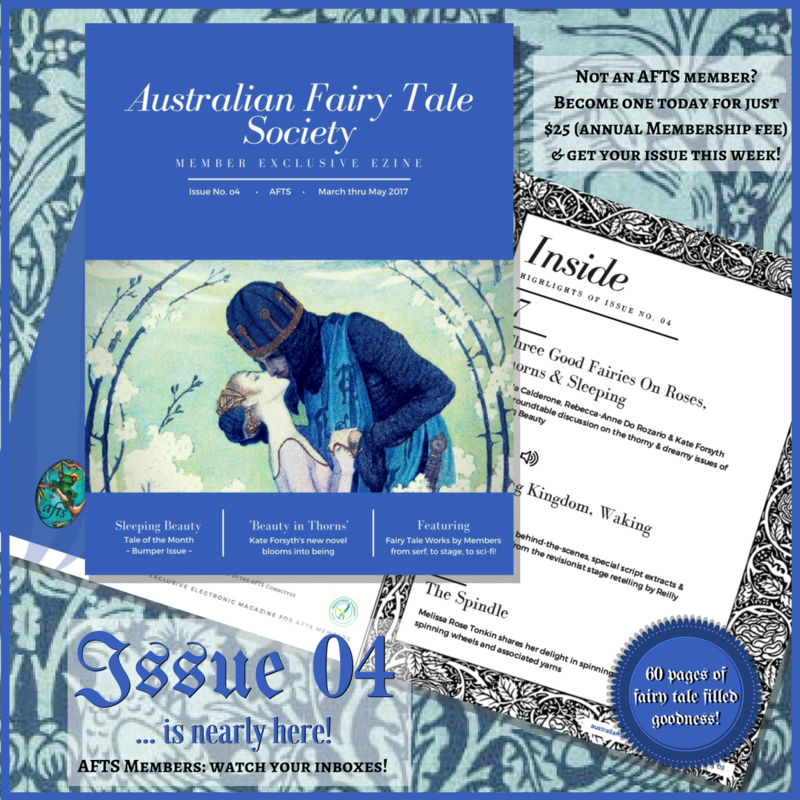 The ezine allows members of the AFTS the exclusive opportunity to submit new fairy tale works, fiction and non, visual and audio, for possible publication in the ezine (which is distributed to all members nationwide and overseas). We would love to see this initiative continue. If you have enjoyed past issues, would like to see more (upcoming fairy tale themes are: Goose Girl, Aladdin, The Handless Maiden, Snow White, Wild Swans/Six Ravens, The Firebird) and could offer some help, please contact the AFTS at austfairytales@gmail.com. 'The aged king pleads with the good fairy..."
We love that Bakst used one of two interesting details Perrault's text includes, which are usually forgotten... (see below). 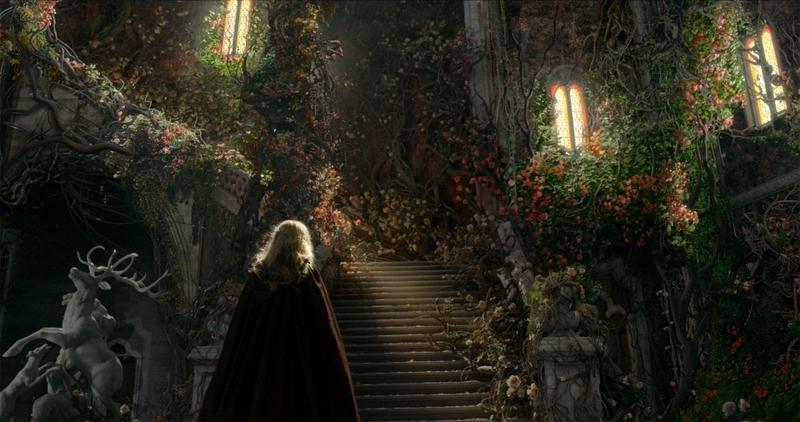 Gans' Gorgeous 'Beauty and the Beast' Is On Netflix! It's not Disney. It's French, luscious and has much more in common with the French literary versions. 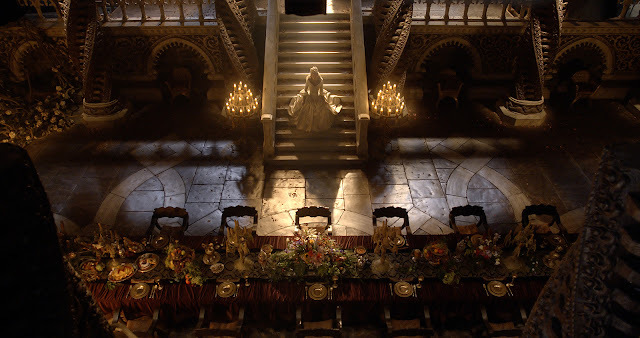 Here Beauty has siblings, her father is a merchant and there is a new-but-feels-old mythical aspect to the Beast's backstory that is probably our favorite addition to the story. There are also a heck of a lot of Cocteau homages and you simply can't help but be amazed by the visual aesthetic brought to the whole production. Even the 'pedestrian' scenes without magic have a glow about them, while any scene with magic is breathtaking. It's biggest criticism is people finding the beginning slow, or that it has "all these extra things about the family", but if you're expecting a musical with animated objects, instead of the merchant backstory and the tale being told to children, perhaps it might seem that way. 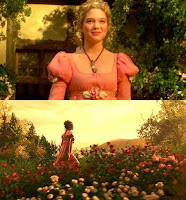 This version initially develops the character of Belle in the context of her family, like the written version, and shows the strain which they are all under, echoing other themes throughout the better-known parts of the story. Despite having no dancing enchanted tea sets, and some additional human drama, this version has a lot of magic - a LOT. Every frame is beautiful and the magic is, well magical, rather than just fancy fantasy. Yes, it's not Cocteau, but if you like fairy tale and fantasy films, you'll be doing yourself a disservice not to check this out. It's a well made and beautiful film. The costumes are gorgeous, the effects are amazing, and it incorporates the importance - and magic - of the garden and roses. 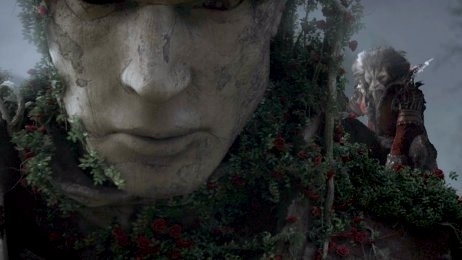 (And we love the use of statues.) There's thrills and adventure, romance, mystery, and sweetness and Belle and the Beast have a feisty, interesting relationship that develops in an unusual way. 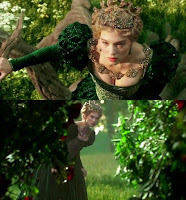 Vincent Cassel as both Prince and Beast is very compelling, (complete with very decent creature make-up and VFX) and Léa Seydoux as Belle is the stunning and modern fairy tale heroine you wish more films had - accessible and gracefully adapting to princess mode without losing that appeal. Most notably, Belle is so independent and has so much agency, even when staying 'true' to her time period, that it doesn't have that whiff of Stockholm syndrome other versions are criticized for. 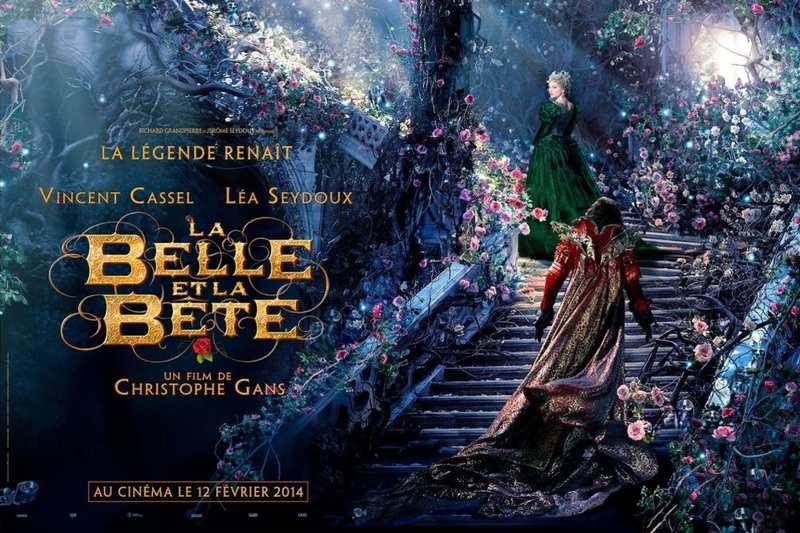 Here's a full clip (in French with English subtitles) in which Belle is late in joining the Beast for dinner. Just know that his story is more complicated (and satisfying) than it appears, even here. 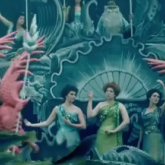 Possibly the most basic and best thing is that this is a full-on fairy tale film. 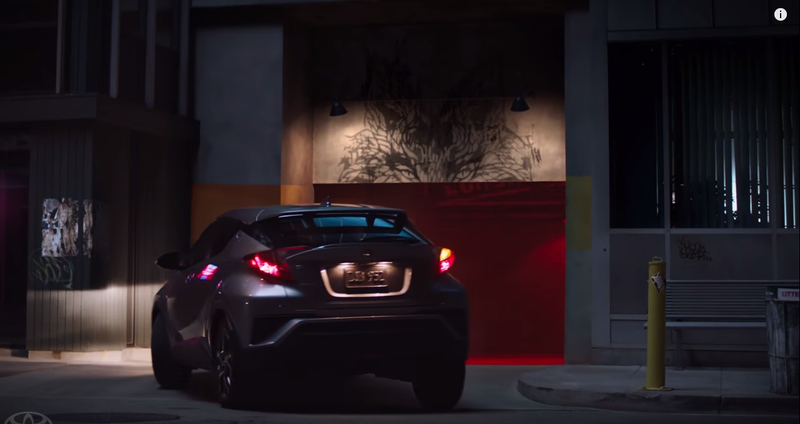 It's a big story, with a lot of scope and once the magic starts happening you are neck deep in fairy tale mode, never to leave again until the credits roll. It also has all the 'original' Beauty and the Beast fairy tale bits and pieces missing from other remakes (though it doesn't get waylaid by fairies or fairy politics, thank goodness!). We only wish we could have seen this in the theater. And yes, that's why we've been so busy. It's a bumper issue (60 pages!) with a lots of diverse new fairy tale works - from short stories, to stage, to storytelling, to sci-fi and much, much more! The issue includes an AFTS exclusive preview chapter from Kate Forsyth's new book 'Beauty in Thorns', (we've read it - it's amazing! ), and a wonderful look at her writing process in weaving together Sleeping Beauty with the romantic and notorious stories behind Edward Burne-Jones' 'The Legend of Briar Rose' Pre-Raphaelite paintings, in a special interview. We already recommend this book, and may just have to import a copy from Oz for our library as soon as hard copies hit Australian shelves this July. 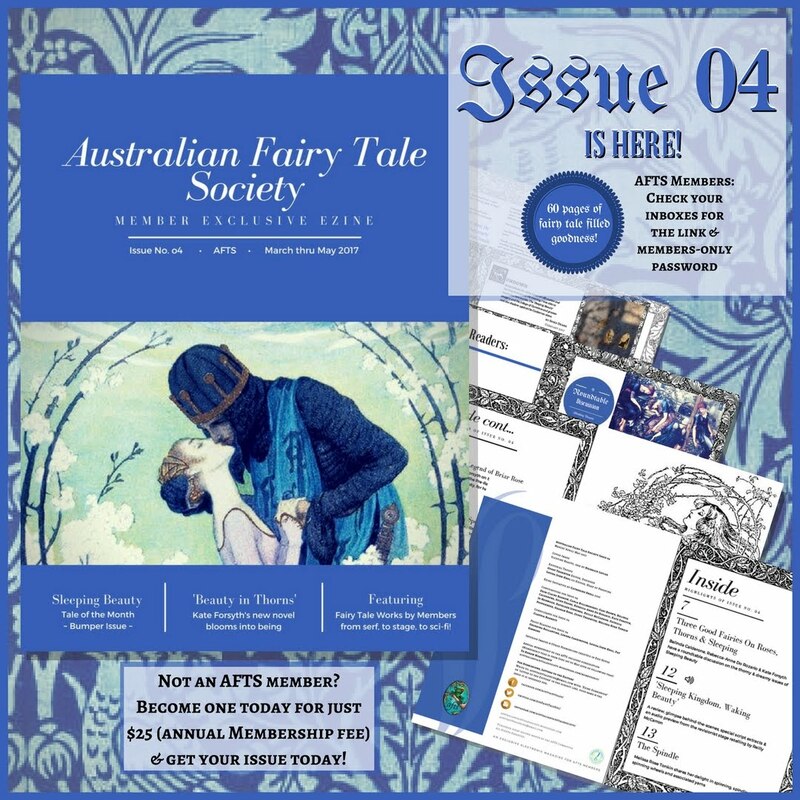 The ezine is available to Australian Fairy Tale Society (AFTS) members only. (It's one of the many benefits of paying an annual membership of $25.) Want to join? You can sign up HERE. watch your inboxes this week for the private member link to download, so you can see it in its proper - and very pretty - magazine format. Expect lots of wonderful fairy tale reading in your very-near future! 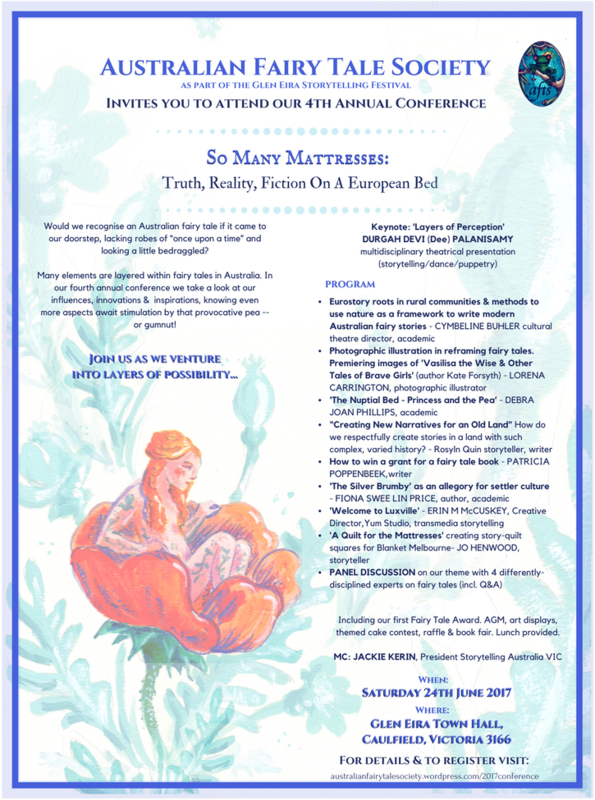 We also want to take the opportunity to mention that the program for the 4th annual conference for the Australian Fairy Tale Society has also been released. The event will take place right after the Australian Winter Solstice on Saturday, June 24th 2017. Please find the program flyer below, designed by our News Hound, Gypsy Thornton, using wonderful artwork by world renowned, Australian artist Kathleen Jennings. Click to view full size.